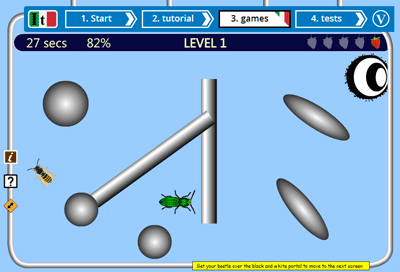 Fast moving interactive game to learn Italian where you control the beetle and the bee moves randomly about the screen. The bee should be avoided and the strawberries collected by answering multiple choice questions about the Italian topic you have selected - this is learning Italian for fun! Fast moving adventure style game with character control via keyboard arrows. Learn or revise your Italian vocabulary and win strawberries for your beetle! Get the beetle to the strawberries and avoid the bees - fun fast game! Choose "The Beetle and the bee" from the Italian games selection page. On the settings page click on the PLAY button to start playing. You are in the first screen of a simple maze. You are the beetle and you want to eat the strawberry but there is a bee who will try to sting you. Each time the bee stings you, you lose a little of your life. Use your keyboard's arrows to move the beetle over the strawberry. When you do, a box will open with a Italian multiple choice question for your selected topic. Click on the correct text to answer the question. If you are right you win the stawberry - in either case, now you must get back to the swirly 'portal' at the top right of the screen. Rolling over the portal takes you to the next screen of the maze. You need 5 correct answers to get to the second level, and 5 correct in the second level to win. It's a fun game, but it is very hard to get through to the end!